Arriving at a rapid and accurate diagnosis is critical during flu outbreaks, but until now, physicians and public health officials have had to choose between a highly accurate yet time-consuming test or a rapid but error-prone test. A new detection method developed at the University of Georgia and detailed in the August edition of the journal Analyst, however, offers the best of both worlds. By coating gold nanoparticles with antibodies that bind to specific strains of the flu virus and then measuring how the particles scatter laser light, the technology can detect influenza in minutes at a cost of only a fraction of a penny per exam. Gold is often thought of as a costly metal, but the new diagnostic test uses such a small amount—less than what would fit on the head of the pin—that the cost is one-hundredth of a cent per test. The researchers noted that the current standard for definitively diagnosing flu is a test known as PCR, for polymerase chain reaction. PCR can only be done in highly specialized labs and requires that specially trained personnel incubate the sample for three days, extract the DNA and then amplify it many times. The entire process, from sample collection to result, takes about a week and is too costly for routine testing. The alternative is a rapid test known as a lateral flow assay. The test is cost effective and can be used at the point-of-care, but it can’t identify the specific viral strain. It also misses up to 50 percent of infections and is especially error-prone when small quantities of virus are present, Driskell added. 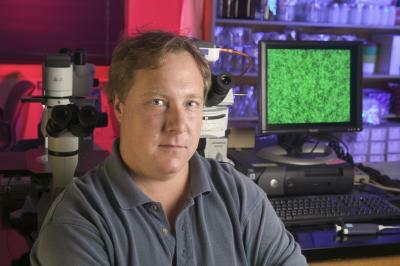 Tripp and Driskell are planning to compare the new diagnostic test with another that Tripp and his colleagues developed that measures the change in frequency of a laser as it scatters off viral DNA or RNA. Tripp also is working to adapt the new technique so that poultry producers can rapidly detect levels of salmonella in bath water during processing. Poultry is the largest agricultural industry in Georgia, he pointed out, so the technology could have a significant impact on the state’s economy.